Winner of the international competition held in 2014 by the Federal Government of Mexico, the project for the large airport of Mexico City by the design group FR-EE with Foster + Partners and NACO presents itself as a strategic piece of architectural and territorial infrastructure for the country in the new millennium, not only due to its scale, but also for the aim of constructing an icon for the nation and a driver of growth for the entire region. Beyond the objections raised regarding the choice of the site in relation to the inevitable transformations of the local ecosystem, with its 743,000 square meters of overall area this will be one of the biggest airports in the world, with three runways, whose number can double thanks to a plan of expansion programmed until 2062. 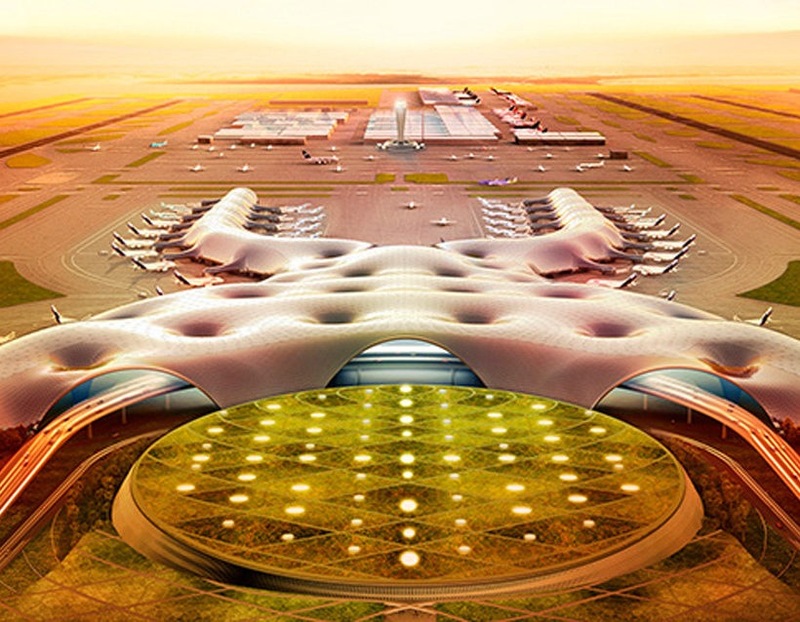 The double-U layout reflecting across a central access node, a large covered plaza seen as the core of the airport, suggests the image of a four-legged creature, an organic and zoomorphic shape that is underscored by the choice of a sinuous, almost sculptural roof formed by modular panels attached over open spans of 100 meters, for a maximum height of 45, extending down to ground level and thus functioning as a vertical enclosure as well. The open, unified interior spaces thus extend below the very large, dense metal structure with its variable geometric form, as in a sort of great continuous pavilion in which to organize routes, gardens, lounge areas, with big views of the sky captured by the connection cones, architectural funnels that reach the ground like huge chalices. Designed to be constructed in just four years, thanks to a painstaking process that optimizes the prefabrication system for potentially infinite growth, the structure that wraps the large airport is produced in Mexico and assembled by local workers, creating clear economic benefits for the whole country. Built without any need for traditional scaffolding, the airport will be a showcase for Mexican innovation, its entrepreneurs and technicians. The whole building – with LEED Platinum certification – has been designed with all the physical plant systems, pipes and conduits below ground level, totally freeing up the large roof structure from any kind of added visual encumbrance, to enhance the free design of the continuous undulating vault. A large sheltered garden is placed between the two open arms of the structure on the side facing the entrance and the passenger exits. 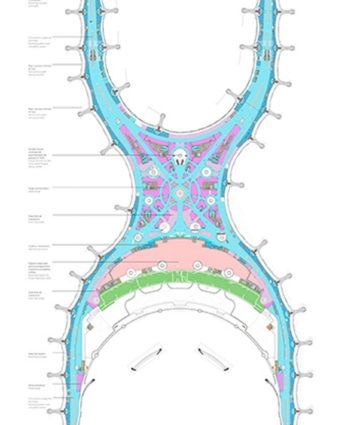 All the departure gates are organized around the long arms of the overall structure like pods connected to a mother organism. On axis with the structure, towards the inner part of the runways facing the service hangars, the control tower is a sort of iconic and colossal torch that is not without its own symbolism. 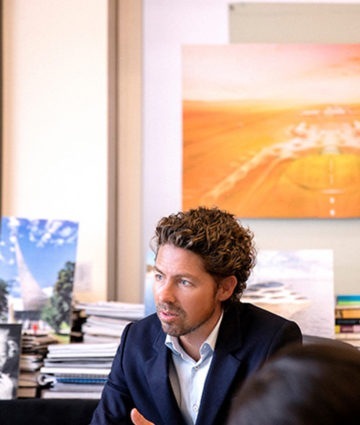 As Fernando Romero explains: “This airport of the future has been designed with inspiration from the past: the form, the symbolism and forceful sculptural dimension of the building are all aspects that link back to the art and architecture of Mexico. The architecture takes its cue from the eagle that devours the snake, one of our country’s most important symbols. The departures area has been designed as a lush cactus garden, with a sinuous shape (the snake) the winds below the roof, which suggests the flight of an eagle, wings spread. The Meso-American symbol of the sun appears right after that, in the central hall with its luminous vault. Arch. Romero, what does it mean to design a work of architecture for social services and the community with a density of values comparable to that of the new gateway for Mexico and the Americas? It is a great honor and an immense responsibility. We are talking about the most important infrastructural project Mexico has ever implemented, which is generating many social and economic benefits for all Mexicans and a remarkable opportunity to develop the northwestern area of Mexico City. It will also be the first LEED Platinum airport in the world, again confirming the commitment of FR-EE to sustainability and ecology. 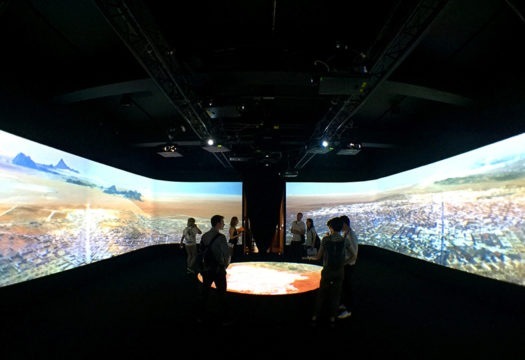 What are the terms of the collaboration with Norman Foster in the organization of the work, with respect to specific roles and forms of expertise? 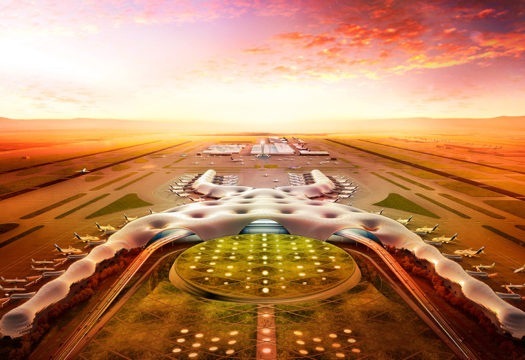 Norman Foster and I are both Master Architects of the airport, whose design is the result of our shared vision, starting with an initial concept that has become compositional proposal and joint supervision of the construction phases. It has been a real partnership and collaboration from start to finish, with both firms working side by side on all the steps, under our direction. 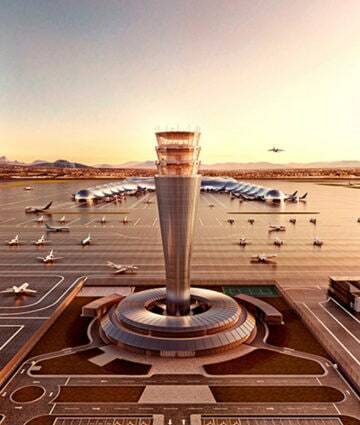 Then, as in all of our projects, to guarantee the best performance for the architectural product, we have been supported by the operative contributions of other consultants, including ARUP for the engineering, NACO for the airport planning and Gehry Technologies for the 3D models. What evolution in the image of the city and behaviors do you foresee being activated or stimulated by this heroic macro-object of architecture? This project is the result of the growth of the aviation industry in Mexico. Over the last 20 years the federal government has carefully analyzed the various options on how to channel this growth, and over the last 10 years it was correctly determined that the best choice would not be that of enlarging the present airport, but instead that of constructing a new master plan that would permit growth up to three times greater than the present situation (from 40 million passengers per year to 120 million). A question of a more general character. What are your expectations for CDMX WDC 2018? What can these 365 days leave behind for the city in terms of prospects for the future? Mexico has been fertile ground for the ideal growth of many arts, a place where modern architecture flourished in the 1950s and 1960s, achieving very interesting results. The project of the airport demonstrates that Mexico can develop and build major works that contribute to the definition of our present identity, as in the past. WDO 2018 becomes a celebration of many other aspects of creativity and change: industrial design and graphic design, fashion, food and beverage design… everything plays a part to increase the visibility and appeal of Mexico, also for tourism, displaying part of the rich culture that already exists in the city in this moment. 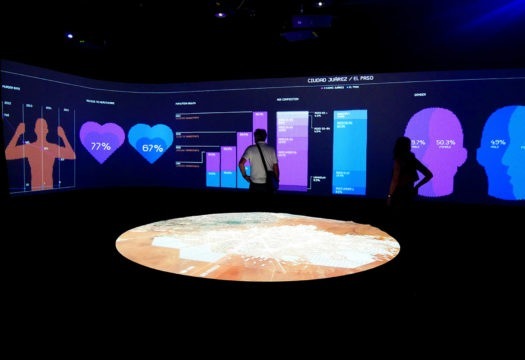 Presented at the London Design Biennale in 2016 with an interactive installation created by the studio Pentagram, the project for a border city invented by Fernando Romero Enterprise on the boundary between Mexico and the United States, between New Mexico, Texas and Chihuahua, seems like a very timely proposal in a moment in which the theme of immigration and the movements of entire populations are being experienced as a problem to be countered by erecting walls, blocking ships and shifting incoming flows from one country to another, like a sort of extreme defense against ‘attacks’ that are actually inevitable movements of people. Building a new wall between Mexico and the United States was one of the focal points of the presidential election in the US in 2016; a slogan Donald Trump exploited to gain consensus, and an idea that is returning in other forms on a European level as well. 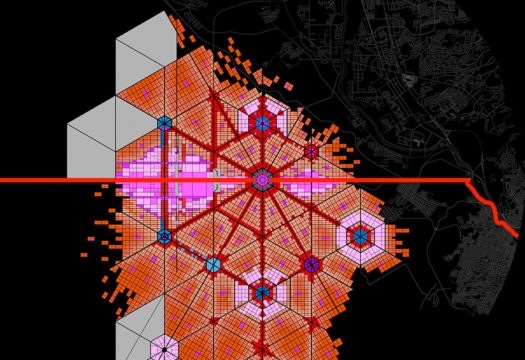 The conceptual and programmatic proposal for the Border City, created by FR-EE, instead takes the approach of joining instead of dividing, of using the borderlines between states as central arteries to activate a process of foundation in the time of a ‘bi-national’ city that brings benefits to both sides of the boundary, using business tools like special economic zones to boost income. 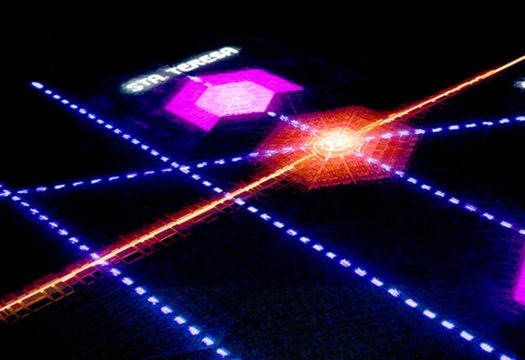 From the viewpoint of planimetric design the choice has gone to a modular hexagonal grid that can expand infinitely, blending the city into the territory in a single new man-made landscape. A proposal that clearly goes beyond the traditional aspects of the discipline to make economic and social, cultural and environmental sustainability the values of reference for the construction of any designed form. The ‘borderline situations,’ the contradictions to be resolved, are multiplying all over the planet in relation to population growth, increased migratory movement and economic globalization. 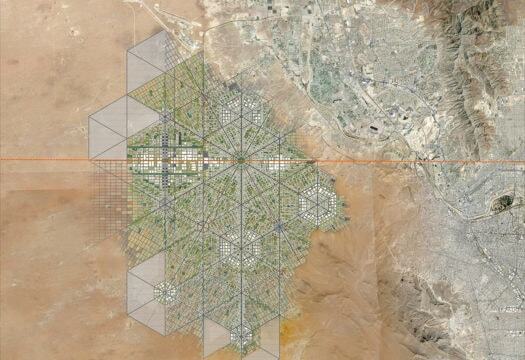 Border City can thus be seen as an ‘urban prototype’ that can be repeated along other national boundaries. 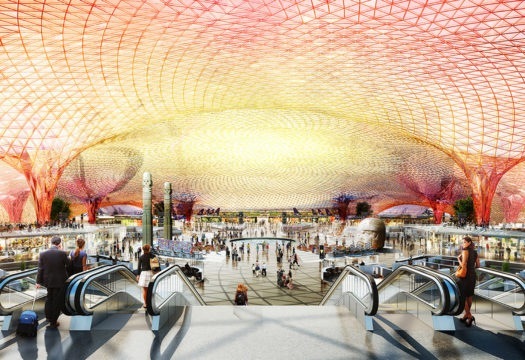 Rendering of the new International Airport of Mexico City, towards the entrance side. The structure with four arms flanked by the fingers for the docking of the aircraft stands out for its variably shaped sculptural roof. A large indoor garden faces towards the city to welcome travelers. View of the control tower, which resembles a large torch. 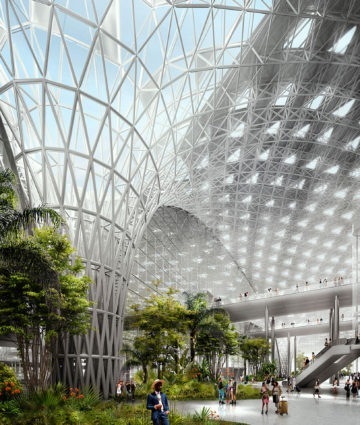 View of the garden inside the airport: the roof flexes at various points to create structural support cones that capture natural light from above, opening towards the sky. 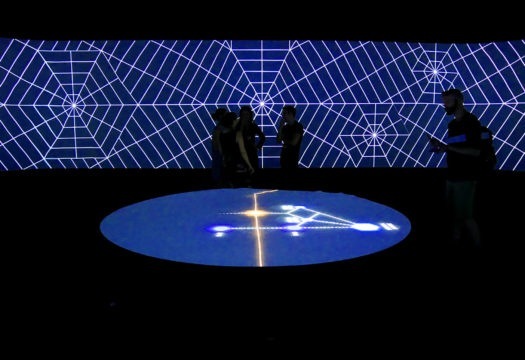 The interactive installation developed by the studio Pentagram for the “Border City” project by FR-EE. The border city uses the boundary line between states (in red) as a central spine on which to create a system of hexagonal blocks that spread out into the territory. Territorial plan of the city on the boundary between Mexico and the USA.